Battlestar Cerberus is more heavily armed than any other ship in the Colonial Fleet, featuring a massive fixed front battery, thirty dual-barrel turret emplacements on the 'spine' of the ship, multiple missile tubes, and an array of point defense guns that can turn the space around the ship into a deadly storm of suppressive fire. The eight barrels of the main battery are positioned just beneath the foremost section of the ship, as seen to the right. These heavy assault cannons are the pinnacle of Colonial military power, delivering an overwhelming focused kinetic impact with a force capable of cracking the armor of most lesser ships in a single volley. 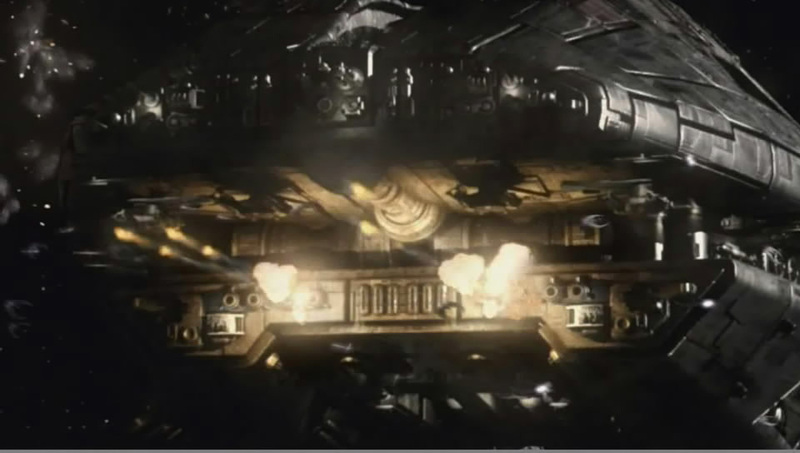 The destructive power of these front guns is limited largely by their narrow firing solution, which requires the Battlestar to be maneuvered head-on toward its target - an extremely dangerous prospect. Their theoretical tactical application (as they have never been fired in actual Colonial conflict) is thus largely considered to be the destruction of orbital constructions and other extremely large, low-maneuverability or static space targets. However, the long range of these guns provides a window of opportunity for striking (and likely disabling) other capital ships before they can close and maneuver, a scenario that few experienced tactical officers would overlook. The remaining large-bore kinetic weapons of the Cerberus are lesser only by comparison to the formidable forward guns. In all practicality, they are the most important part of the ship's arsenal, forming the bulk of its organic offensive capability and providing deadly firepower that can be brought to bear in almost any direction at a moment's notice. The thirty twin turrets are spread across the back ship's hull and require that the ship be maneuvered into an engagement envelope to employ them in either an orbital bombardment scenario or in a naval battle. Seen to the left, here, are a set of the numerous anti-aircraft artillery (AAA), or 'flak', guns. The entire battlestar is covered with these gun positions that provide a concentrated layer of protection around the ship. These guns fire medium-caliber explosive shells that operate on a time-delay fuse. The shell leaves the barrel and travels a predetermined distance before exploding and sending out a wave of shrapnel designed to rip apart either an enemy ship or missile. The guns can also be slaved to the DRADIS system and set to 'Full-Auto' which means that anyone or anything that strays into the engagement envelope or closer will be targeted by a certain percentage of the gun systems to ensure rapid elimination. The Cerberus, like most other ships in the fleet, has missile warfare capabilities. While they are not as extensive as some of the systems like the one designed for the Praetorian, the Cerberus has the capability to sling a respectable number of missiles towards a target at once. These missiles are armed with conventional warheads only but, in theory, could be modified to carry tactical nuclear warheads - the other deterrent. The Cerberus carries sixteen purpose-built strategic nuclear missiles that are a completely separate system from the conventional warheads and they reside in their own launchers. Each missile carries a set of six MIRVs (Multiple Independently-targetable Re-entry Vehicles) that have scalable capabilities that go from 750 Kilotons to fifty Megatons (Nagasaki was ~10 Kilotons. 1000 Kilotons to a single Megaton). Missile package controls reside with Weps, as does their targeting, but the only people on the ship who have access to arming, targeting, and firing the strategic nuclear arsenal are the Commanding Officer, Executive Officer, and the TACCO. The Tactical Officer must give his/her consent to Nuclear Release but is not given a key or any positive control. Security of these weapons resides with Colonial Marines and any modification to nuclear armaments must be personally approved by a member of Command Staff. The Mercury class of Battlestars exceeds its predecessors in almost every measure. Physically, it is larger in every dimension. It boasts heavier armor, multiple redundant systems, and more firepower than any previous class of ship. Due to all these factors, the Mercury-class is also considerably heavier than its predecessors, requiring a proportionately more massive propulsion system. And this is exactly what it has. While previous Battlestars like Galactica employed six fusion-powered thrusters arrayed around the rear of the ship, Cerberus and other ships of its class possess eight massive engines of similar, albeit updated and highly efficient design. The clustered thrusters are sufficient to accelerate the ship, and can provide rudimentary steering via adjustments to the output balance between the eight individual exhausts. 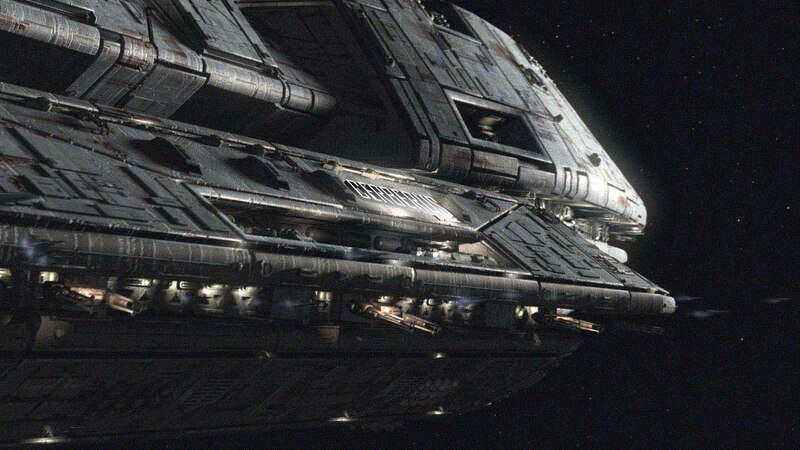 The majority of maneuvering, however, is performed by countless small thrusters arrayed around the ship. Although there is no technology in existence that could truly make a Battlestar agile, these thrusters, absent conflicting momentum, are capable of turning the ship in any direction in a relatively short period of time. An additional pair of heavy arrest thrusters are located toward the front of the ship and serve to provide a breaking mechanism, but are limited in output compared to the main engines. For this reason, the ship is rarely accelerated to its highest safe speeds, particularly if other maneuvering is expected. Like all modern Battlestars, Cerberus features external hangar facilities (commonly called 'pods'), long, wing-like superstructures which extend from the main hull at mid ship on both the port and starboard sides. While common to all classes, the hangar pods of the Mercury-class Battlestar are unique in several ways. First and most notably, the extensions are fixed, rather than retractable, as was the case in earlier designs. The static format allows these structures to be proportionately larger than on previous ship classes, accommodating more deck real estate, additional Viper tubes (which run in a line down the side of each hangar pod), and space for heavy automated machinery that assists in both launch and retrieval. Although the loss of retraction makes it is impossible to fully secure the bays against the body of the ship, a system of segmenting blast doors can be closed frame-by-frame to isolate the bay, in whole or part. This allows the bays to be closed to space if necessary during combat, or for individual sections to be sealed for damage control purposes. 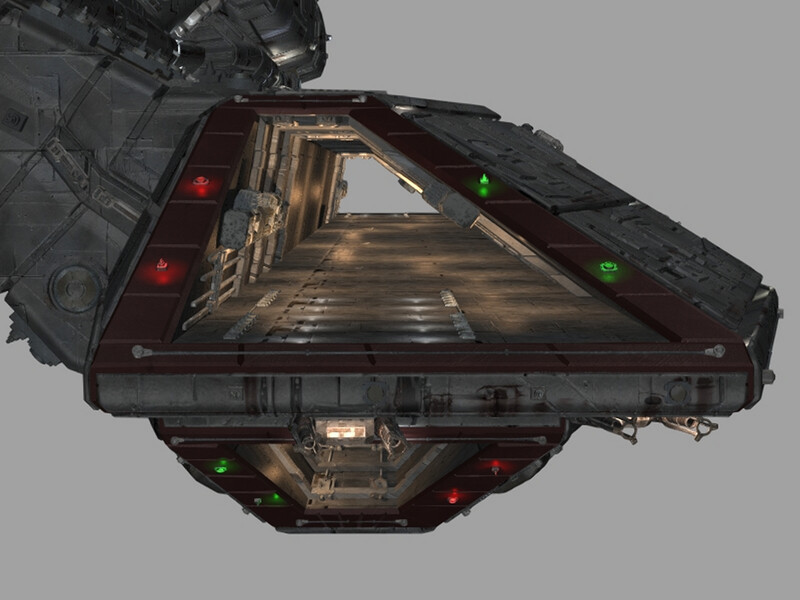 The second obvious change to the launch pods from earlier Battlestar classes is found in their unique dual-level design that accommodates two hangar decks in each pod. As pictured, the two decks are reversed and stacked on top of one another, so that one is upright and the other upside-down, relative to the body of the ship. The dual-deck approach provides a total of four active hangars between the two pods. Between both the larger hangars and the double-decked configuration, the Mercury-class achieves a huge improvement in its total usable runway space. This, along with its myriad, highly-automated launch tubes, vastly improves its overall efficiency and potential volume of carrier activity when compared to its predecessor classes. As the nerve center, the brain of any Battlestar, the Combat Information Center serves as its ultimate organizational hub and hosts command consoles for communications, sublight and FTL navigation, power, damage control and weapons - indeed, for nearly every ship-board system. And nowhere else is the level of technological advancement and sophistication characteristic of the Mercury-class more apparent. While the controls for individual ship systems follow familiar standards in the Colonial Fleet, nearly all of the CIC consoles feature new features, options, and improvements, and most of all, a high degree of computer assistance and integration. Although commands within the CIC itself are issued in the traditional fashion, vocally by the CO to the XO to the various stations, the operation of individual systems relies on a coordinated mix of human and automated action to carry out. Thus, CIC officers must not only be confident in their ability to command and the ability of those in their sections to perform, but also in their proficiency with these systems. This is particularly noteworthy in weapons operation, damage control, and Viper launch and recovery, as these systems all feature high degrees of automation. Although these systems are seen as superfluous by many veteran officers, there is no question of their efficacy: Without computer networking, integrated fire control, and a host of other mechanized systems, it would be impossible to man the massive vessel with such a small crew, one half the size of those employed by previous Battlestars.